I love this photograph of Salvador Dali, because I think that it typifies a lot of ideas regarding Dali’s own persona and his art work. 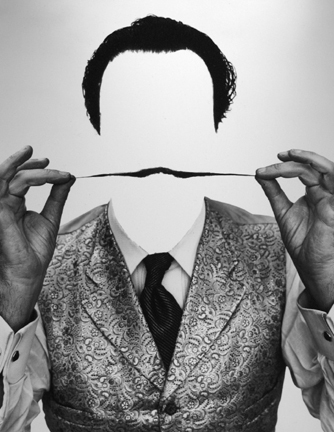 On one hand, the photograph is somewhat similar to a double image (a typical visual trope that appears in Dali’s art), since the white negative space implies a face without depicting one. The other reason I love this photograph, though, is that casts Dali in a certain type of light. As an “invisible” figure in this photograph, Dali is a person, but obviously not a “regular” or “normal” person. He is special. Ever the eccentric, Dali wanted to be seen as someone who was different from regular society. In many ways, I think that his career and personality are an explosive reaction to the “artist-genius” construct which had slowly developed in Western society since the Renaissance. (In fact, speaking of the Renaissance, I think that Dali also viewed himself as a “Renaissance Man,” as evidenced by how he characterizes himself during his appearance on the game show “What’s My Line?” in 1957.) Dali wanted to claim special creative powers and psychological abilities as an artist-genius, which I think ties into Dali’s “paranoiac-critical method” (his term) that he used when creating art. Just like Dali wanted to be seen as fluctuating between the sane and insane, Dali often painted “double-image” works of art (as a result of paranoiac-critical activity) which can simultaneously be “read” in at least two ways. One of the best examples of such double imagery is Metamorphosis of Narcissus (see below). There are lots of things in this painting that can play with the viewer’s eye and mind, but I think that the most common example is that the figure (Narcissus) looking into the water on the left is mirrored on the right by the image of a large hand holding a cracked egg. More double-image details in this painting are discussed in a short video clip by Smarthistory. Dali began to work on The Invisible Man, therefore, about the same time that he began to establish his ideas about the paranoia-criticism. Dali’s ideas about paranoia-criticism changed and morphed (as did his art) over time, which make his theory difficult to discuss in a nutshell.6 (If you do know of other ways to concisely discuss this method, please share!) 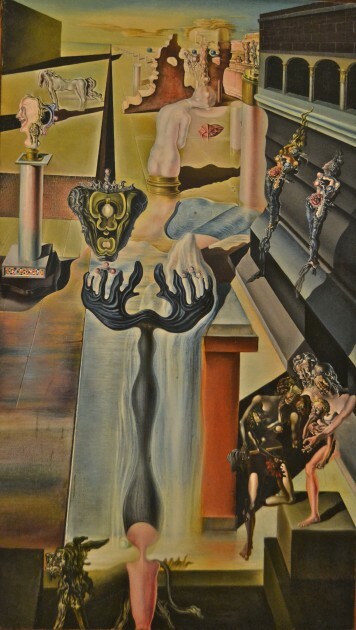 But I agree with Haim Finkelstein in that Dali wanted to promote his method in order to gain favor and theoretical legitimacy with the Surrealist group in the 1920s.5 In that sense, Dali didn’t want himself to be seen as an “invisible man” among the more scientifically-engaged Surrealists at the time. Dali’s relationship with the Surrealist group did not last forever. In a famous trial in 1934, Dali was expelled from the group. In some ways, I think that his paranoiac-critical method was a little too personalized for the other Surrealists. This ego-centric methodology and mentality of an artist-genius must have been confirmed to the other members of the group when Dali said, “I am Surrealism!” in response to his expulsion. Of all the artists who have described or claimed to be an artist-genius, I’m pretty sure that Dali is the only one who has claimed to a drug! You can’t get much more unique than that. 1 Marilyn Stokstad and Michael W. Cothren, Art History, 5th edition (Upper Saddle River, New Jersey, Pearson, 2014), 1058. 2 Haim Finkelstein, “Dali’s Paranoia-Criticism or the Exercise of Freedom” in Twentieth Century Literature 21, no. 1, Essays on Surrealism, (Feb. 1975): 64. 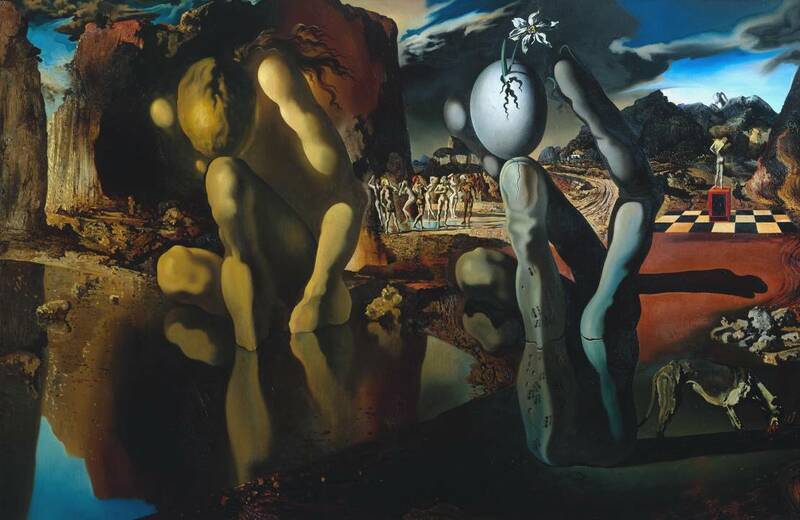 4 It is interesting to consider how Dali was proud of Metamorphosis of Narcissus as an example of his method and work. When Dali met Sigmund Freud in 1938, he took this painting with him to show Dr. Freud an example of his method and work. 6 For a more complete discussion of Dali’s paranoiac-critical method, see Finkelstein article. 7 One such example of how other Surrealists methods differed from Dali is in Max Ernst’s essay “Au-delá de la peinture” (first published 1936). Ernst skeptically differentiates between Dali’s method and Ernst’s own practical process of frottage. Ernst also says that how Dali’s paranoia-criticism is “a pretty term which will probably have some success because of its paradoxical content” but cautions that “inasmuch as the notion of paranoia is employed there in a sense which does not correspond to its medical meaning.” See Finkelstein, 59. Tonight I stumbled across some interesting information which has caused me to think more deeply about the reason why marsh scenes sometimes appear in Egyptian tomb imagery. 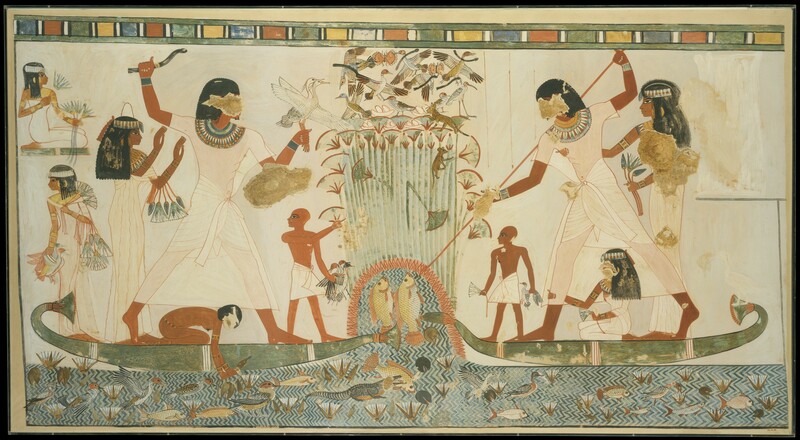 To be honest, when I previously have considered these types of scenes (the most famous one being the “Fowling Scene” from the Tomb of Nebamun, shown below), I have usually thought more about the act of hunting than the marsh setting itself. Perhaps I’ve taken marshes for granted in Egyptian culture, since I know that they are located along the Nile. However, the marsh setting has a lot of symbolic associations in ancient Egyptian culture and mythology, most notably with life and resurrection. 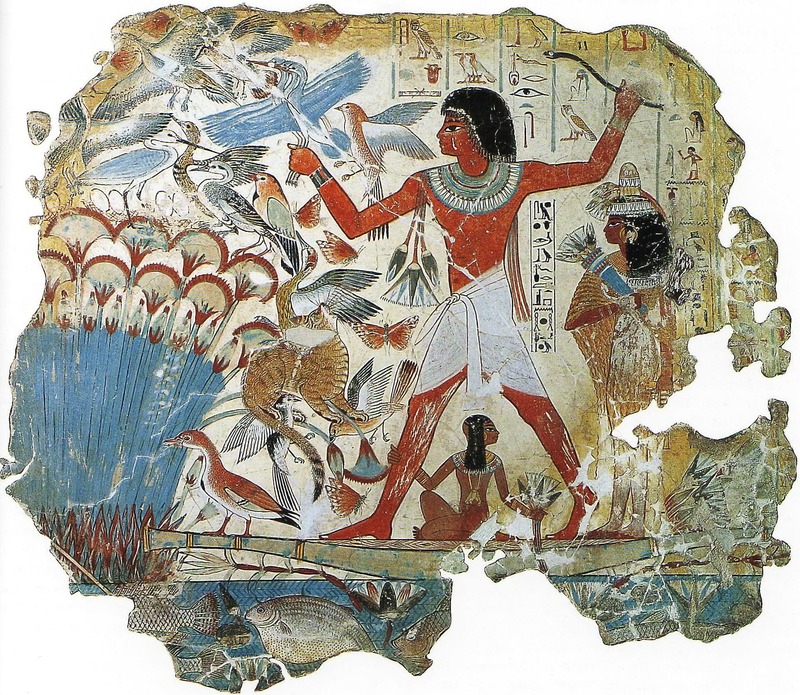 There are several reasons why marshes are connected with life and resurrection in Egyptian culture. In the creation mythology for the ancient Egyptians, life was first formed out of the primeval waters of chaos (Nun), creating a primeval marsh and mound of fertile earth (the latter is sometimes referred to as the benben, due to the benben stone at Heliopolis which represented this primeval mound). Marshes, therefore, were a reference to creation and life. In the case of the two images that I have included in this post, the tomb owners Menna and Nebamun draw parallels between their hope for rebirth in the afterlife and the original birth of the world by depicting themselves within a marsh. Additionally, marshes were also significant in Egyptian mythology because Isis helped to prepared her husband Osiris’s body for resurrection by hiding his coffin in a marsh.1 Later, Osiris’s evil brother Seth stumbled upon the casket and tore Osiris’s corpse into various pieces (the number of pieces vary in accounts, ranging from fourteen to forty-two). Isis searched for each of the pieces and buried each at the place where it was found.2 Later, Osiris resurrects: the dismembered body comes together to form the first mummy. There are many other elements within marshes that also have symbolic associations with life and resurrection, most notably the papyrus and lotus plants. 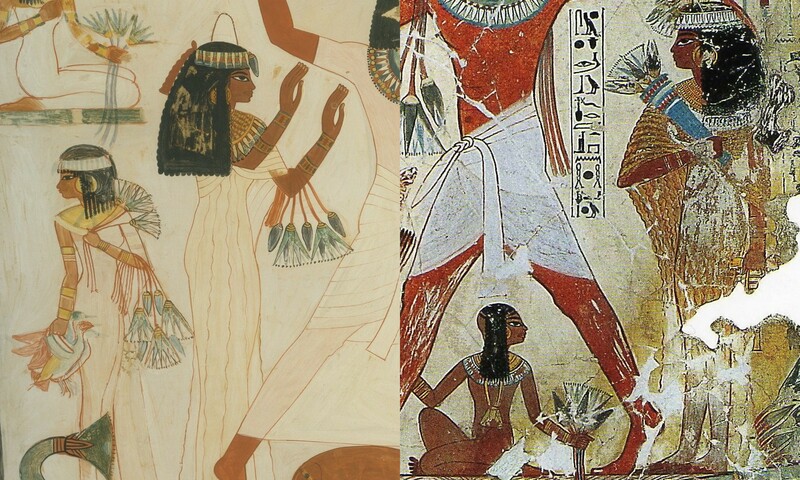 In both of these images, Menna and Nebamun hunt birds that are found in a thicket of papyrus. The thicket of papyrus also might be a reference to the mother-goddess Hathor, who sometimes appeared as a cow in a similar thicket of papyrus (see one such example from the Papyrus of Ani).3 Hathor, who is associated with motherhood and fertility (among other things) reinforces the symbolic associations between papyrus, the marsh, and life in this context. Do you know of any other symbolic associations with marshes in Egyptian culture? Do you know of any other Egyptian fowling scenes that are set in marshes? I know that marsh imagery also appears in other contexts as well, such as the Great Hypostyle Hall at Karnak. There, the capitals of the columns are decorated with lotus and papyrus blossoms. Considering the number of columns that appear in that vast hall, I’m sure that ancient Egyptians within that space felt very much like they were in a marsh thicket. Within that sacred space, I imagine that the symbolic associations with the marsh would have been very clearly understood. POSTSCRIPT: There are a few more things that I want to add about these two hunting scenes, just so I can remember them in the future! “The act of throwing a throwstick in ancient Egyptian is qema, for the Egyptians this would recall the word qema meaning ‘to create’ or ‘to beget.’ In the same way the word for spearing fish is set, which resembles another word seti meaning ‘to impregnate.’ Through these puns the actions of the tomb owner can be read as having meanings appropriate to rebirth.”5 I think it is interesting to note that both Menna and Nebamun’s powerful poses recall the similar raised arm of Narmer in the Palette of Narmer, which was created about 1,650 years before! The wild birds in these scenes represent chaos. By hunting these birds, the male figure is restoring order. In this sense, the men are equating themselves with Osiris. Unsurprisingly, fowling is one of the activities of Osiris, who triumphed over chaos by defeating his evil brother Seth. Both Menna and Nebamun are shown as youthful, energetic figures. This suggests that both men hope to have a similar, youthful forms in the eternities. I’ve always associated youthful idealism with the Greeks up until this point, but I can see that youth was also favored by the Egyptians too. Could it be that the Greeks were influenced by Egyptian thought in this regard? 1 Mark Getlein, Living with Art, 10th edition (New York: Mc-Graw HIll, 2013), 331. 2 For more information on the Osiris and Isis mythology, see Ian Shaw and Paul Nicholson, The Princeton Dictionary of Ancient Egypt (Princeton: Princeton University Press, 2008), 238-239. Today is somewhat of an exciting day at my house. We moved into our place a few years ago, and over the past several months we have been accruing reproductions of our favorite pieces of art to display around the house. Today, the final framed print arrived! Although I’m sure that we will buy some more pieces over time (and hopefully actual works of art one day, not just reproductions), I think we are set in our arrangement for the time being. I wanted to jot down some things about the pieces that we decided to purchase for our home over the past few years, so I can remember a little bit about each work. (I also remember enjoying when my friend Hasan wrote a similar post last fall, which ended up being one of the last posts on his site.) Keep in mind that my husband and I have a collective aesthetic that is very narrow. I love older historical pieces, while my husband prefers modern and contemporary art. We usually are able to find a middle ground in art from the nineteenth century as a compromise. 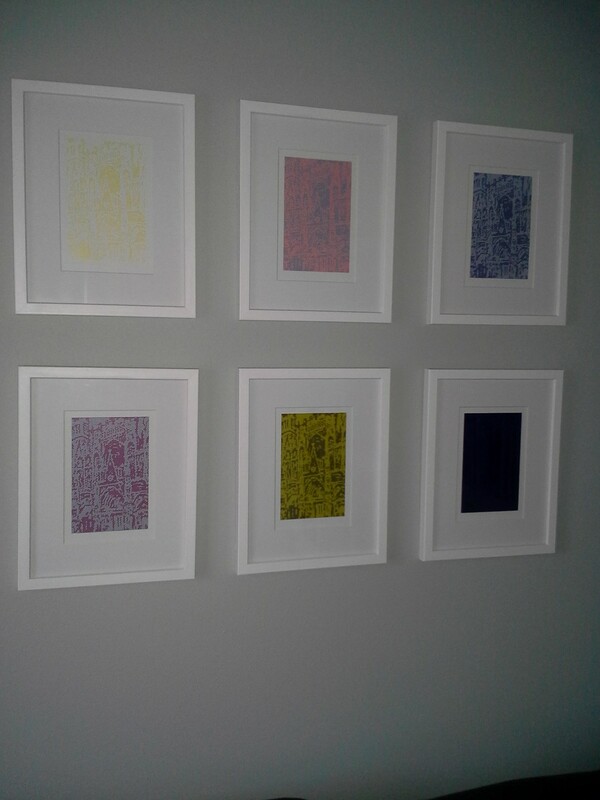 We have a small set of prints that were made to promote Lichtenstein’s “Rouen Cathedral” series. Of course, Lichtenstein’s printed series was made in homage to Monet’s famous paintings. The painted series by Lichtenstein is made out of ben-day dots, and the paintings are blown up to a large scale so that the dots are extremely visible. I’m not sure if the complete series by Lichtenstein was finished. When we bought this set, we also received a flyer (printed in April 1969) which mentioned that the actual projected series had fourteen paintings by Lichtenstein, although it remained unfinished at the time the flyer was written. (If anyone knows more information on this series, please share!) 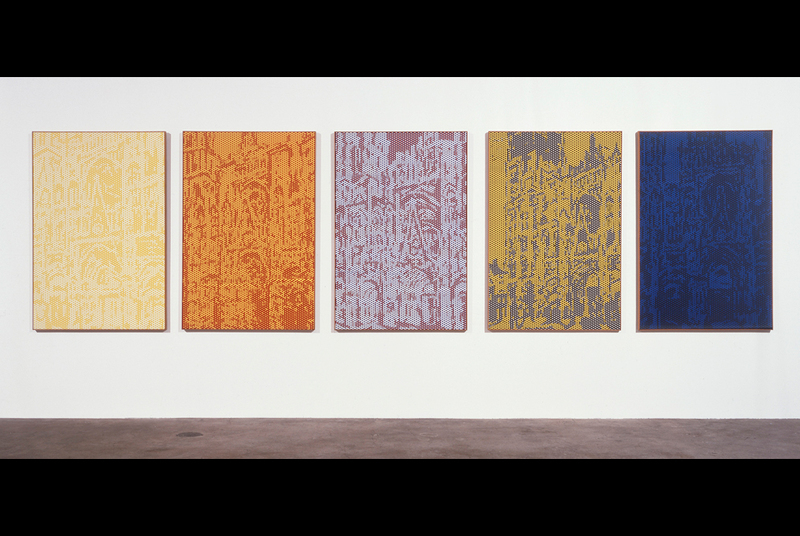 At present, I am aware of two sets from this series: Rouen Cathedral, Set V (1969) and Rouen Cathedral (Seen at Five Different Times of Day), Set III (1968-69). 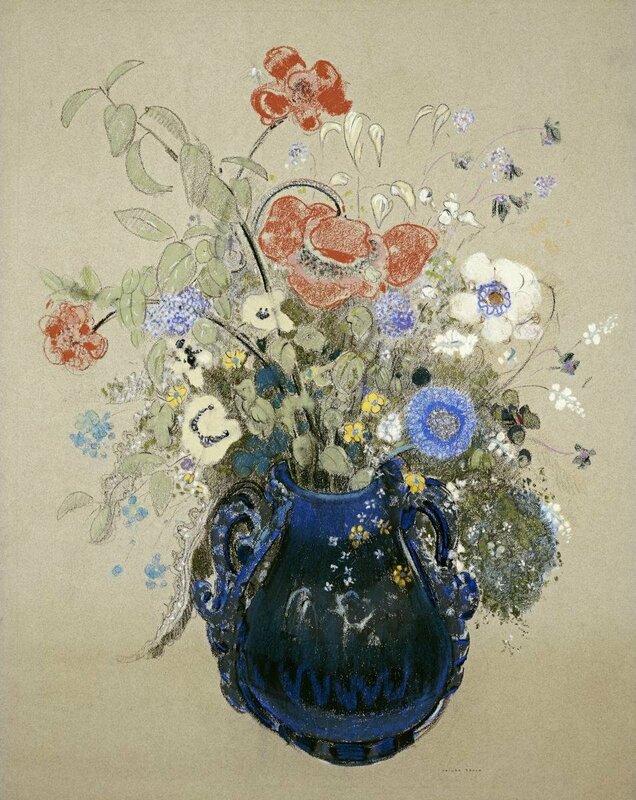 Odilon Redon, “A Vase of Blue Flowers,” c. 1905-1908. Pastel on paper, private collection. My husband gave this Redon print to me for Christmas a few years ago, as the first work of art to hang in our new place. Unlike the bizarre and fantastic imagery which Redon created during much of his career, Redon created a lot of pastels of flowers during the last fifteen years of his life. I like a lot of his floral still lifes, but this one works especially well within our living space. 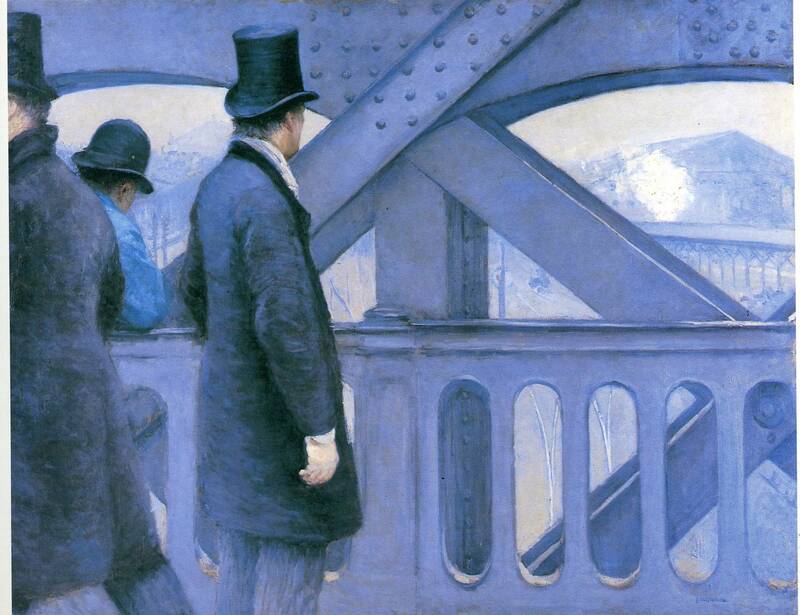 Gustave Caillebotte, “On the Pont de l’Europe,” 1876. Oil on canvas. Kimbell Art Museum. We got a print of On the Pont de l’Europe (1876-1877) by Caillebotte after seeing the original during a trip to the Kimbell Art Museum in December 2011. I really like the bluish-grey color palette and asymmetrical composition of this piece. In fact, I think I like this painting better than Caillebotte’s other treatment of the same bridge (see Le Pont de l’Europe from 1876). One of the things that I think is interesting about my print is that the scene overlooks the Saint-Lazare train station, a place which served as subject matter for many of Monet’s paintings. More information about this painting can be found HERE. 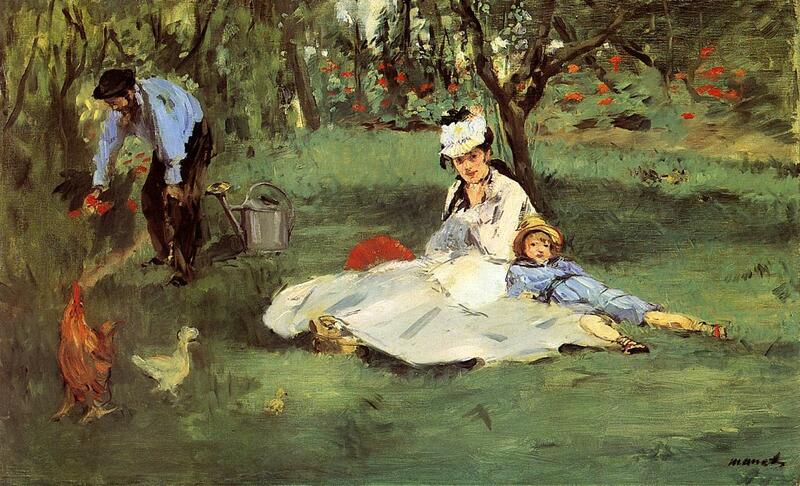 I got a print of “The Monet Family at Argenteuil” around the time that I wrote a post which included this painting. In that post, I mentioned that Manet and Renoir worked side by side in 1874 to paint the Monet family members. I think Manet’s painting is so much better; Renoir’s Madame Monet and Her Son (also called Camille Monet and Her Son Jean in the Garden at Argenteuil) is simply atrocious in comparison to Manet’s strong composition and use of color. 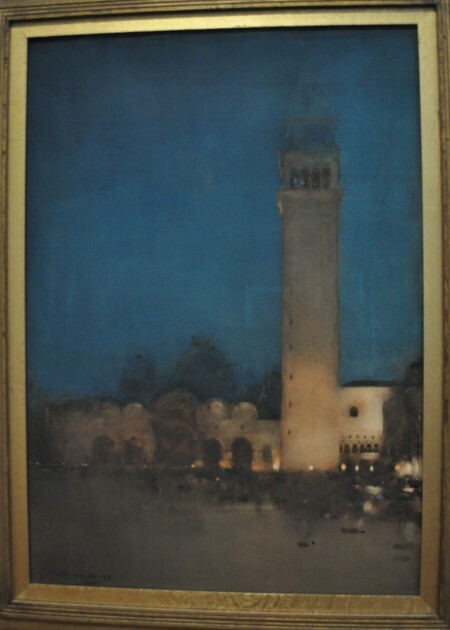 Arthur Melville, “The Blue Night – Venice,” 1897. Watercolor and gouache on board, Tate Museum. After visiting London last summer, we got a copy of Melville’s The Blue Night – Venice (1897). I saw this painting while visiting the Tate with my cousin; my husband was visiting Cambridge that morning and missed going to the Tate with us. I took this photograph to show my husband, and we both liked the painting so much that we wanted to buy a print as a momento. We have a very small print of Klimt’s “Attersee” (1901), which my husband got after a trip to Vienna last fall. 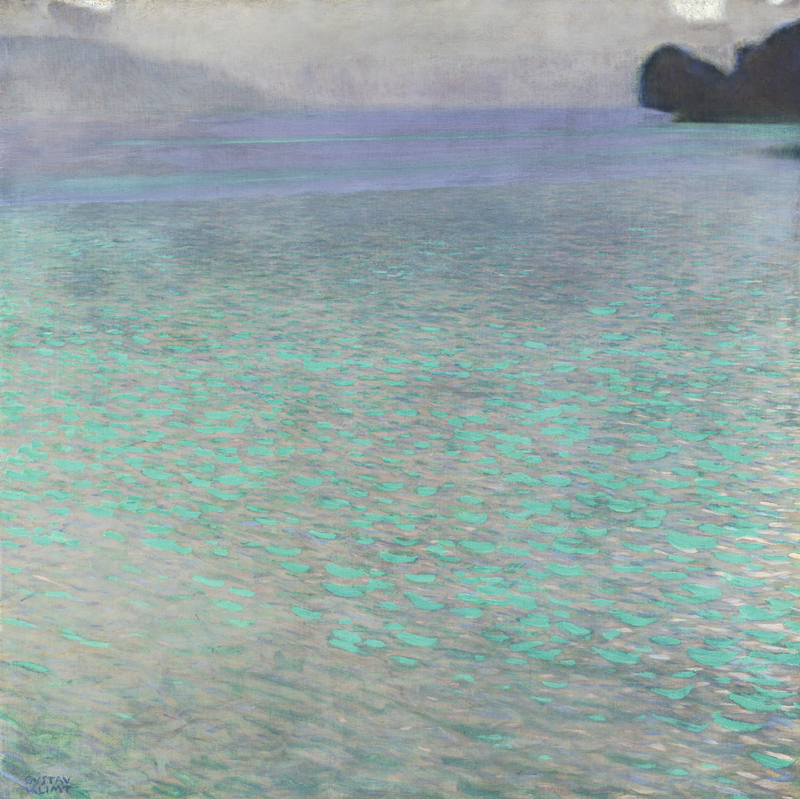 This painting is of a Lake Attersee, which Klimt visited repeatedly as a summer retreat. Klimt would travel to Attersee to spend summers with his lifelong companion, Emilie Flöge, and her family. 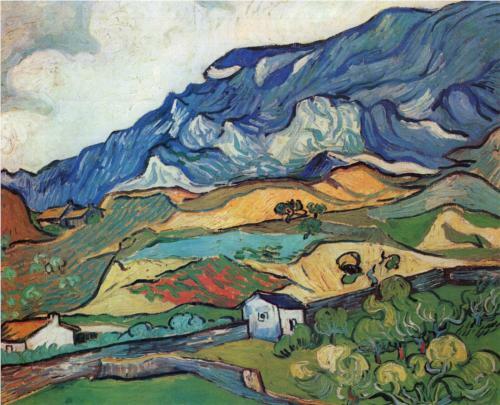 He also painted other works of art during this same retreat in 1901, including Tannenwald I and Tannenwald II. More information about this painting is found HERE. We also got this poster print after my husband returned from his trip to Austria. Some view this poster as an anticipation of Cubism and Art Deco.1 I am still trying to find more information about this poster and its imagery, but I did find out that this poster was included in an exhibition at Harvard, which highlighted a “subversive triumvirate” of the feminine, the decorative, and the abstract. I have wanted to have a some type of Van Gogh print in my home for some time. I really love his Almond Blossom (1890) painting, but I don’t have the right wall colors in my home to complement the blue background. My husband and I liked this print not only for its colors, but also because we weren’t familiar with this painting before stumbling upon it online. This particular painting was done during the period when Van Gogh lived in Saint-Rémy (from May 1889 until May 1890); Van Gogh voluntarily admitted himself into the Saint-Paul asylum located in this area. The print that we received today is a copy of this painting by Willem van Aelst. I’m afraid that my print does not look nearly as luminous as the actual painting itself, but I’m still happy. I’ve liked the idea of having a Dutch still life in my home for some time, but my husband and I could not find a print that we both liked. However, my husband saw this painting in the Rijksmuseum during a recent trip to Amsterdam, and I readily agreed that it would look nice in our home. I love all of the little details in this painting, from the butterflies and bugs to the small key that is connected to the ribbon. And, just for fun, I’ll end this post with some fake “Homage to the Square” prints that my family created a few years ago. 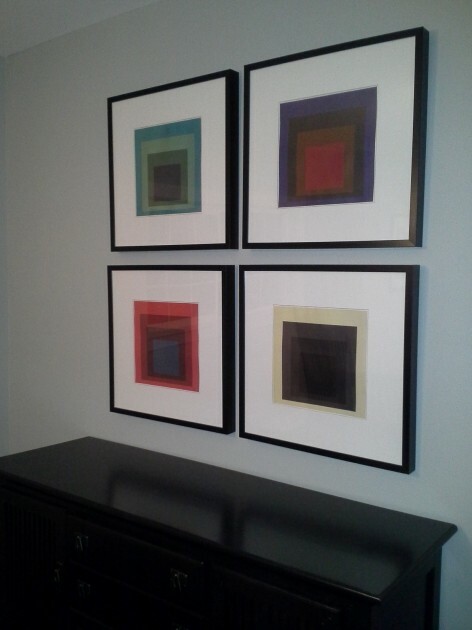 My husband really loves the work of Josef Albers, but we couldn’t find prints in his square series which fit with the colors we wanted to highlight in our home. So, we designed our own! My son and I each picked out one of the color schemes, and my husband chose the final two. He designed the prints based off of actual Albers prints. 1 Philip B. Meggs and Alston W. Purvis, Meggs’ History of Graphic Design, 5th edition (John Wiley & Sons, Inc., 2011). Text available online HERE.